The East won all three armored field battles today. 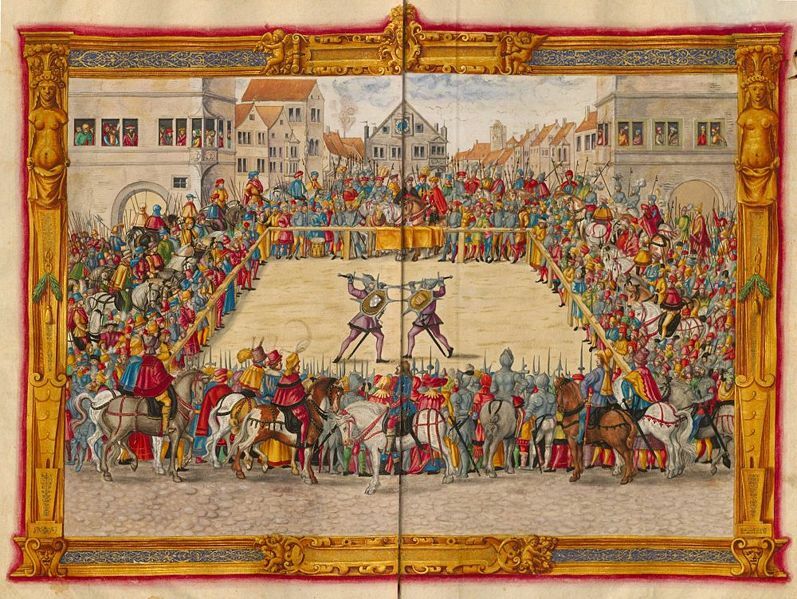 The fencing field battles were split, with two won by the Mid and one by the East, giving the war point to the Midrealm. Results are courtesy of Mistress Anastasia, HRH Brion, and Mistress Alys Mackintosh. The position of Society Marshal will soon be open. Candidates must apply in writing to the Board of Directors. This is an unpaid position. The position entails administrating the marshallate activities of the Society and coordinating the activities of the kingdom Earl Marshals. Reports are required to be filed quarterly to the Board summarizing the martial activities of the Society and of each kingdom. The Society Marshal is also responsible for holding meetings to communicate with the kingdom Earl Marshals. The successful candidate must be well versed in administrative techniques, problem solving, and interpersonal communications. Knowledge of marshallate policy, rules, and procedures is essential. The ability to travel is necessary, as well as having a telephone and e-mail. Knowledge of the traditions and history of the Society is required. Resumes (both professional and medieval, including offices held and awards received) must be sent to the attention of the Board at the SCA Corporate Office, P.O. Box 360789, Milpitas, CA 95036-0789. Resumes must also be emailed to resumes@sca.org, with a copy to marshal@sca.org. Resumes must be received by April 1, 2015. Questions regarding this position may be directed to Shawn Lindsey (Ritter Asoph Hearts) Society Marshal. He may be reached by phone at 817-822-4303 (please no calls after 9 PM CST), or via email at marshal@sca.org. The last of the Pennsic war points were decided today with the armored castle battles, siege weapons competition, and the end of the populace archery war points. The East won the majority of the six points for the castle battles as well as six of the nine points of the populace archery war point. The Middle won the siege weapons war point. Unofficial reports indicate that the East Kingdom won the war by 3 points. EDITED TO ADD: The full points spread is now available at the Pennsicwar website. The East won with 25 points to the Midrealm’s 20. Though the days are warm and the season of battle rages wildly around us, it is the wise warrior who also looks to the future and the coming autumn when a full harvest moon rises over the land and the summer’s adventures are all but memories. The Province of Malagentia (Southern Maine) invites one and all to our Harvest Moon Shoot to be held on September 14th at the fabulous Ossipee Valley Fairgrounds in the town of South Hiram, ME. The day will feature something for everyone including a wide range of archery competitions for young and old, novice and veteran, as well as a series of Malagentian Provincial Championship tournaments including archery, heavy list and thrown weapons. There will also be a lighthearted rapier tournament. For more details you can visit the event website and join the event on Facebook. Malagentia’s favorite bar the Tyger and Bucket Tavern will be joining the Harvest Moon Shoot this year to provide merriment, food, and fun long into the evening. This will be run as a separate event and an announcement will be available soon. Duke Timothy of Arindale, won the Crown Tournament of Aethelmearc today, fighting for Duchess Gabrielle van Nijenrode. Their Hignesses last reigned in the East in A.S XXXII.